Lactobacillus salivarius; oral malodor; periodontal diseases, probiotics. Probiotics is on the horizon of decreasing various diseases, by suppressing the pathologic colonization. The main characteristic of probiotics is that it stimulates health promoting flora. According to the definition, probiotics are food constituents having living microbes that when used in ample amount provides beneficial health related effects on the host. Previous literatures have highlighted that probiotics effects are strain specific, each with separate health benefits. Lactobacillus genera are one of the most commonly used probiotic bacterial strains and generally regarded as safe. The use of probiotic especially lactobacillus plays a significant role in dentistry. Oral halitosis is a global problem of the human community, owing to be one of the major dental public health threats. It is the one of the three causes patients approaching for dental treatment, succeeding dental caries and periodontal diseases. Since malodor is multifactorial in nature, there are numerous etiologies resulting in metabolism of anaerobic microflora present chiefly at dorsal surface of tongue in turn producing volatile sulfur compounds[7,8]. Several strategies were developed to prevent or reduce oral malodor. One of the current concepts of oral malodor treatment comprise an essential reduction of number of oral bacteria causing malodor or controlling the microbial composition of the oral cavity. The anaerobic microflora causing malodor regain to their initial numbers once the treatment ceases. However various therapies for oral malodor had exhibited only a short term effect, there are recent protocols involving a step explaining the involvement of beneficial microflora to aid and counter the propagation of odiferous microflora. Streptococcus mutans, which is a cariogenic bacterium, were found to be reduced in the oral cavity by consuming products containing L. rhamnosus or L. reuteri[10,11]. Also the decrease in the number of black-pigmented anaerobic rods in saliva was reported by the administration of L. salivarius T12711 (LS1)[12,13]. L. salivarius WB21 used in the present study is an acid tolerant microbe. It is a strain specific lactobacillus probiotic derived originally from L. salivarius WB1004. The parent bacteria are seen to be effective against Helicobacter pylori. The oral consumption in the form of tablets of L. salivarius WB21 has been reported to improve periodontal conditions of smokers by reducing periodontopathogenic bacterium Tannerella forsythia in subgingival plaque[15-17] and also found to reduce oral malodor of patients with genuine halitosis. In Indian context there were no literature extracted for the treatment of oral malodor using L. salivarius WB21 tablets. As there are various dietary, lifestyle and immunological differences present between populations of various countries, the study was conducted considering the null hypothesis stating that there was no effect of L. salivarius WB21 tablets on oral malodor. The aim of the study was to evaluate subjectively the effectiveness of these probiotic tablets on oral malodor among adult patients attending dental institution of Mysuru city, India. 1) To assess periodontal health (probing pocket depth, plaque, bleeding on probing), tongue coating, salivary flow and oral malodor at baseline among adult patients having genuine halitosis (pathological & physiological) attending dental institution in Mysuru city, India. 2) To assess and compare periodontal health (probing depth, plaque, bleeding on probing), tongue coating, salivary flow and oral malodor post intervention after 2 and 4 weeks. 3) To compare the effect of intervention between participants having physiological and pathological oral halitosis. It was an open label interventional pilot study conducted on 21 participants (Males 52.4% and females 47.6%, age range from 20 - 42 years) attending outpatient department of JSS Dental College and Hospital in India, with a chief complaint of halitosis during September - October 2015. The sample size was estimated using n Master software (Version 2.0) considering the data of previous study. Sample size estimated for our pilot study was 21. Considering dropouts of the participants the sample size was 24. Figure 1 shows the flowchart of the current study. Overall 30 participants were screened and participants fulfilling the following eligibility criteria were recruited: 1) Willing to participate in the study; 2) More than 18 years of age; 3) Having oral malodor above a questionable level; 4) Not currently visiting a dentist for treatment; 5) Non-edentulous; 6) Non-smokers; 7) Having no adverse reactions to lactose or fermented milk products; 8) Not using antibiotics in previous 3 months. Finally, 24 appropriate participants were determined based on the exclusion criteria that are 1) Having acute symptoms requiring immediate oral cavity treatment; 2) Wearing prostheses; 3) Using probiotic supplements; 4) Having systemic illness. The eligible 24 participants were divided into two groups (12 participants with physiological halitosis and 12 with pathological halitosis). The participants with physiological halitosis had probing pocket depth (PPD) less than 5 mm and tongue coating score (TCS) less than 3, while those with pathological halitosis had PPD ≥ 5 mm and TCS ≥ 3. None of the participants had a history of antibiotics therapy in 3 months prior to their enrollment. Figure 1: Flowchart of the methodology and participants for an open label interventional pilot trial was conducted using patients with oral malodor. The study was conducted in accordance with the guidelines of Declaration of Helsinki for biomedical research involving human subjects (World Medical Association Declaration of Helsinki, 2001). The study protocol was approved by the Institutional Ethical Committee, JSS Dental College and Hospital, Mysuru (Approval No. JSSDCH/PGS/Ethical/31/2015-16). The study protocol fulfilled ADA guidelines 1997, Adjunct Dental Therapies. Written informed consent was obtained from each participant prior to their enrolment. The consent forms were provided to study participants in Kannada/English language, as per their language preference. The tablets (Minna No Zendamakin WB21 Tablet; Wakamoto Pharmaceutical Co, Tokyo, Japan) containing 6.7 x 108 colony-forming units of L salivarius WB21 and 280 mg of xylitol per tablet were used in the present study. Each participant was given a reminder calendar along with the prescribed number of tablets (42 tablets for first 2 weeks). The tablets were given in separate 14 packets having 3 in each for each day. Participants were asked to fill the reminder calendar after consuming tablet for the day. Participants were directed to place a tablet on the tongue for a few minutes and allow it dissolve. After 2 weeks, post intervention data was collected and participants were given another 42 tablets for the next 2 weeks. They were instructed to consume tablets in the same manner. Participants were requested not to use any other probiotics, antibiotics, alcohol and tobacco during the intervention period. The dose throughout the test period was maintained at 1 tablet 3 times per day, taken orally after eating and mouth cleaning procedures. The baseline information and the post intervention information on dental plaque, periodontal health, degree of tongue coating, volume of stimulated salivary flow, and oral malodor was assessed by the same investigator who received training and calibration. The participants were requested to report any adverse effect immediately to the principal investigator. The assessments of organoleptic test (OLT) and clinical parameters at the baseline and 2 and 4 weeks were conducted in the morning before brushing. The severity of oral malodor in each individual was determined using an OLT, which is a gold standard for the measurement of oral halitosis. Each participant was instructed to exhale through the mouth with moderate force into a 10 cm length hollow Teflon pipe attached with a screen for 2 to 3 seconds. The participants were instructed to tightly hold end of the pipe, not allowing breathe to mix with room air. The participants were instructed to blow in the pipe within its diameter. At the same time, investigator assessed breathes from the other end of pipe keeping nose near to it. The procedure was repeated three times before a final score was entered according to Rosenberg et al scale, which is 0: Absence of odor, 1: Questionable odor, 2: Slight malodor, 3: Moderate malodor, 4: Strong malodor, 5: Severe malodor. The clinical oral evaluation was done to record number of teeth present, caries, filling and missing teeth, plaque, periodontal pocket depth (PPD); bleeding on probing (BOP); degree of tongue coating; volume of stimulated salivary flow. PPD and BOP were measured at 6 points around each tooth in all of the subjects. The tongue coating score (TCS) was assessed using Winkel Tongue Coating Index (WTCI) by dividing the tongue into 6 segments and scored as 0: having no coating, 1: light tongue coating and 2: heavy tongue coating. Plaque was evaluated using the Silness & Löe Plaque Index (PlI). The volume of stimulated salivary flow was measured using the chewing gum test. The patient was asked to pool saliva in the oral cavity and spit into a vessel every minute throughout the 5-minute collection period. All assessments of oral malodor and clinical parameter were assessed by an investigator who received training and calibration. The principal investigator was trained and calibrated in the department of Periodontology JSSDCH, under an experienced OLT examiner, using a 100 ml of freshly prepared sodium sulfide (Na2S) solution titrated at different concentrations. This was done twice at an interval of one week to evaluate the olfactory sensation of the investigator and train him/her for the same. The inter examiner agreement was found to be satisfactory with a Cohen’s Kappa coefficient value of 0.8. Further, intra examiner reliability assessment for oral malodor, dental plaque, tongue coating, bleeding tendency, and probing depth was done on 10 adult volunteers. The assessment for OLT was done on two consecutive days early morning before brushing teeth. The intra-examiner reliability for OLT was good with a kappa co-efficient value of 0.75. The kappa values for intra-examiner reliability for clinical parameters were 0.69 (PlI), 0.67 (TCS), 0.70 (BOP) and 0.70 (PPD). The data analysis was done using Statistical Package for Social Science version 17.0 software (SPSS Inc., IBM). The quantitative variables were presented as mean and standard deviation while qualitative variables as frequencies and percentages. Shapiro- Wilk’s test (P > 0.05) and a visual inspection of their histogram showed data were approximately normally distributed. Chi square test was used to determine the distribution of participants in relation to age and gender. - Comparison of scores between baseline, 14th and 28th day was done using Repeated Measures Analysis of Variance (RMANOVA). - The differences in various parameters at baseline and post intervention between subgroups were assessed using Mann Whitney U test. All of 24 participants with genuine halitosis were divided into the physiological halitosis group of 12 and the oral pathological halitosis group of 12. After starting the investigation, 3 participants dropped out. Therefore, the analysis was performed on 21 participants, consisting 10 physiological and 11 pathological halitosis subjects. There were 50% males (n = 5) and 50% females (n = 5) in the group of physiological halitosis, and there were 54.5% males (n = 6) and 45.5% females (n = 5) in the group of physiological halitosis. In addition, 10% (n = 1) in the physiological halitosis group and 18.2% (n = 2) in the group of pathological halitosis were more than 35 years. Figure 2 shows the overall demographic characteristics of the study subjects, explaining the age and gender distribution of the study population. There was no significant difference (P = 0.476) found between age and gender. Figure 2: Age and gender distribution of study participants. As described in Table 1, baseline line characteristics of the study participants was to compare the clinical and oral malodor parameters between physiological and pathological halitosis. Subjects with oral pathologic halitosis had periodontitis and significantly higher numbers of PPD of 5 mm or more (P = 0.001) and average PPD (P = 0.001), as compared with the participants with physiologic halitosis. The percentage of BOP in the subjects with oral pathologic halitosis was also significantly greater than that in the subjects with physiologic halitosis (P = 0.001). Also, the tongue coating index and plaque index was significantly higher in pathological halitosis (P = 0.001). Table 1: Comparison of clinical parameters and oral malodor among participants with physiological and pathological halitosis at baseline. Table 2: Changes in the clinical and oral malodor parameters in participants with oral physiological halitosis after 14 and 28 days following intervention. The changes in the clinical and oral malodor parameters between baseline, 2 and 4 weeks with the administration of L. salivarius WB21 among the participants with physiological halitosis is given in Table 2. The inflammatory factor (percentage of BOP) decreased and stimulated salivary flow increased. The baseline mean plaque score was 0.7 ± 0.2 which was same at 2 weeks. The mean PlI significantly reduced at 4 weeks (0.54 ± 0.1) (P = 0.006) compared to baseline values. Difference in mean PII between 2nd and 4th week also was statistically significant (P = 0.005). We also witnessed a significant reduction in the mean TCS (P = 0.001) and PPD (P = 0.007) following the intervention compared to baseline. However, the reduction in mean PPD between baseline and 2nd week was not statistically significant (P = 0.105). Although, oral malodor parameters decreased after 2 weeks, reduction was not statistically significant (P = 1.0). However, the reduction in OLT score was statistically significant after 4 weeks (1.4 ± 0.5) compared to baseline (P = 0.002) as well as between week 2 and 4 (P = 0.009). 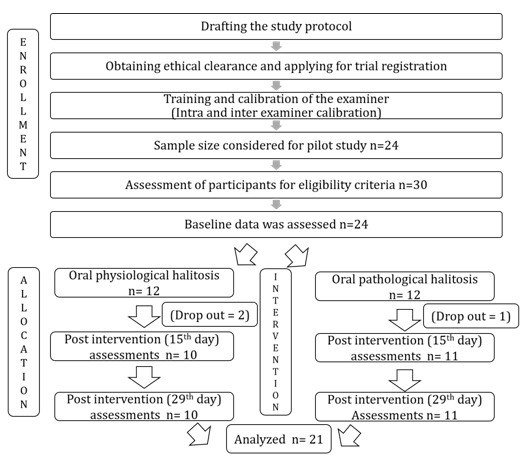 Table 3 shows the changes in the clinical and oral malodor parameters of 11 participants with oral pathological halitosis post-intervention at the baseline, 2 and 4 weeks. It was observed that, the inflammatory factor (percentage of BOP) significantly decreased at 2 weeks (47.56 ± 8.8) and 4 weeks (42.43 ± 10.31) compared with baseline (50.06 ± 8.3, P = 0.001). Also, there were a significant decrease in mean PlI, mean PPD and TCS. Whereas, stimulated salivary flow rate significantly increased post intervention. There was an insignificant decrease (P = 0.104) at 2 weeks post intervention (4.00 ± 0.9) for mean OLT score when compared to baseline (4.36 ± 0.7). But with further intake of L. salivarius WB21 tablets for 4 weeks, it was found that the mean OLT scores were decreased to 3.00 ± 0.5, and this result was statistically significant (P = 0.001). Table 3: Changes in the clinical and oral malodor parameters in participants with oral pathological halitosis after 14 and 28 days following intervention. Table 4 showed that pathological halitosis participants showed greater reduction in clinical parameters and organoleptic scores than physiological halitosis. The changes of PlI (P = 0.001), the number of ≥ 5 mm PPD (P = 0.001) and TCS (P = 0.002) for 2 weeks were greater in participants with pathological halitosis compared to physiological halitosis. Furthermore, the changes of all clinical parameters for 4 weeks were significantly greater in participants with pathological halitosis, except for OLT score (P = 0.069). Concerning OLT score, the reduction was greater in the participants with pathological halitosis, but there was no significant difference between two groups (P > 0.05). Table 4: Comparison of mean differences in OLT scores, clinical parameters between different time intervals among participants with Physiological and Pathological halitosis. The use of L. salivarius WB21 containing tablets significantly reduced OLT scores in both the physiological halitosis and pathological halitosis groups. Yaegaki K et al explained that volatile sulfur compounds, which were main component of oral malodor, were produced in large amounts in subjects with periodontal disease and high amount of tongue coating. In the current study, the clinical parameter related to periodontal disease and tongue coating were significantly reduced at 2 weeks after oral administration of L. salivarius WB21 tablets. Subsequently the significant reduction of OLT scores was observed at 4 weeks. Concerning periodontal parameter, the BOP and mean PPD were reduced in both physiological and pathological halitosis participants after intervention compared to baseline. In addition, the number of more than 5 mm PPD was also reduced in the participants with pathological halitosis. The previous studies using L. salivarius WB21 tablets in Japan showed the similar outcome[17,20]. The pilot trial by Iwamoto T et al showed the significant reduction of BOP in the participants with pathological halitosis. This study explained that physiological halitosis participants had substantial improvement than pathological halitosis considering the fact that the probiotic micro-organism persuades a beneficial shift in physiological halitosis. A randomized control trial by Suzuki N et al in their study disclosed that the average PPD and number of BOP sites significantly improved on day 14 compared with day 0 in the probiotic period. It could be due to the reduction of inflammation and tissue destruction of pathological halitosis by antagonizing against pathogenic bacteria. Though the quantitative analysis of bacteria was not performed in the present study, it could be considered from the previous literatures of Suzuki N et al and Mayanagi et al that the number of micro-organisms like Fusobacterium nucleatum and T. forsythia were significantly lower post intervention within a 2 and 4 weeks respectively. This was suggested to recover oral malodor and periodontal conditions. One of the etiologies of oral malodor is coating on dorso-posterior region of tongue coating. Malodor is attributed to severity of periodontitis and microorganisms present in tongue coating that release volatile sulfur compounds. The reduction in TCS could be due to directly dissolving a tablet and having a mechanically affect the reducing the accumulation of microbiota in tongue coating. In previous studies[17,20] no reduction in tongue coating was found after consuming L. salivarius WB21 tablets. This contradiction can be explained by variations present in the lifestyles of two different geographic locations. It could also be due to the difference in the method of assessment of tongue coating index between the current and previous studies. Hence, the effect of L. salivarius WB21 tablet on pathological and physiological halitosis on oral malodor after 4 weeks of consumption was probably due to decrease in other clinical parameters. This could be because of increase in L. salivarius WB21 bacteria in oral cavity, which in turn reduced various periodontopathogenic bacteria and also VSC producing bacteria. This mechanism explained in previous researches[16,17,20], may explain the mode of action of L. salivarius WB21 in our study as well. Strength of the present study was conducting the study by a single calibrated trained examiner, ruling out the inter examiner bias. Also, gold standard universally acceptable techniques were used for oral malodor (Rosenberg et al) and patient compliance was considered sufficiently by providing separated packets containing only 3 tablets for a day. Although, well established methods were used to assess oral malodor in the present study, the subjective nature of these could be a limitation. The assessment of oral malodor using objective parameters such as VSC concentration in mouth air can validate these results. The microbial assay was not done in the present study. Studies using microbial analysis through BANA or PCR could specifically assess microflora producing odiferous compounds. Hence it is concluded that 1) There was a significant reduction in clinical oral parameters (bleeding on probing, tongue coating score and stimulated salivary flow) at 2 weeks when compared to baseline in physiological and pathological oral halitosis participants by consuming L. salivarius WB21 tablets regularly thrice a day. 2) There was also a significant decrease in organoleptic score, plaque index, and average probing pocket depth in both the groups at 4 weeks. 3) Pathological halitosis post intervention had shown better results when compared to physiological oral halitosis. Further studies, preferably large scale randomized control trials are essential to substantiate our findings. Studies assessing the effect of probiotics on immune system in addition to those assessing antimicrobial activities are the needs of hour. Ideally, these investigations should include subjective and objective measures of oral malodor. This can eliminate bias due to subjective variations. Studies using biochemistry markers, PCR, BANA, ELISA and other possible explanatory variables should be considered to elucidate the role L. salivarius WB21 on reduction of bacteria in causing odiferous compounds. There was no adverse drug reaction reported in the present study. Various antibacterial agents were assessed and proven to be effective in reduction of oral malodor. Probiotics have the potential to reduce oral malodor as they mediate their effect through host immune besides antibacterial activity. Considering the possibility of recurrence of oral malodor following cessation of use of L. salivarius WB21 tablets on short term basis, it is advisable to continue their usage on daily basis along with routine oral hygiene practices. We appreciate Wakamoto Pharmaceutical Co. Ltd, for providing the tablets containing L. salivarius WB21. 1. Nagaraj, T., Ravi, B., Sankara, S.N., et al. Probiotics and oral health. (2012) J Ind Academy of Oral Med Radiol 24(2): 146–148. 2. Ashwell, M. Concept of functional foods. (2002) ILSI (International Life Sciences Institute) Europe, B-1200 Brussels, Belgium ISBN 1-57881-145-7. 3. de Vrese, M., Schrezenmeir, J. Probiotics, prebiotics, and synbiotics. (2008) Adv Biochem Eng Biotechnol 111:1–66. 4. Saxelin, M., Tynkkynen, S., Mattila-Sandholm, T., et al. Probiotic and other functional microbes: from markets to mechanisms. (2005) Curr Opin Biotechnol 16: 204–211. 5. Haukioja, A. Probiotoc and oral health. (2010) Eur J Dent 4(3): 348–355. 6. Ghapanchi, J., Darvishi, M., Mardani, M., et al. Prevalence and causes of bad breath in patients attended Shiraz dentistry school- A cross sectional study. (2012) Elixir Human Physio 53(2012): 12051–12054. 7. Loesche, W.J., Kazor, C. Microbiology and treatment of halitosis. (2000) Periodontol 2000 28: 256–279. 8. Scully, C., el-Maaytah, M., Porter, S.R., et al. Breath odor: etiopathogenesis, assessment and management. (1997) Eur J Oral Sci 105(4): 287–293. 9. Suzuki, N., Yoneda, M., Hirofuji, T. Relationship between oral malodor and oral microbiota. In: Virdi MS, ed. (2012) Oral Health Care Rijeka, Croatia: In Tech 121–130. 11. Çaglar, E., Cildir, S.K., Ergeneli, S., et al. Salivary mutans streptococci and lactobacilli levels after ingestion of the probiotic bacterium Lactobacillus reuteri ATCC 55730 by straws or tablets. (2006) Acta Odontol Scand 64(5): 314–318. 12. Ishikawa, H., Aiba, Y., Nakanishi, M. Suppression of periodontal pathogenic bacteria in the saliva of humans by the administration of Lactobacillus salivarius TI 2711. (2003) J Japan Society Periodontol 45(2003): 105–112. 13. Matsuoka, T., Sugano, N., Takigawa, T., et al. Effect of oral Lactobacillus salivarius TI 2711 (LS1) administration on periodontopathic bacteria in subgingival plaque. (2006) J Japan Society Periodontol 48(4): 315–324. 14. Aiba, Y., Suzuki, N., Kabir, A.M., et al. Lactic acid-mediate suppression of Helicobacter pylori by the oral administration of Lactobacillus salivarius as a probiotic in a gnotobiotic murine model. (1998) Am J Gastroenterol 93(11): 2097–2101. 15. Shimauchi, H., Mayanagi, G., Nakaya, S., et al. Improvement of periodontal condition by probiotics with Lactobacillus salivarius WB21: a randomized, double-blind, placebo-controlled study. (2008) J Clin Periodontol 35(10): 897–905. 16. Mayanagi, G., Kimura, M., Nakaya, S., et al. Probiotic effects of orally administered Lactobacillus salivarius WB21-containing tablets on periodontopathic bacteria: a double-blinded, placebo controlled, randomized clinical trial. (2009) J Clin Periodontol 36: 506–513. 17. Suzuki, N., Yoneda, M., Tanabe, K., et al. Lactobacillus salivarius WB21-containing tablets for the treatment of oral malodor: a double-blind, randomized, placebo-controlled crossover trial. (2014) Oral Surg Oral Med Oral Pathol Oral Radiol 117(4): 462–470. 18. Julious, S.A. Sample size of 12 per group rule of thumb for a pilot study. (2005) Pharm Statis 4(4): 287–291. 19. Rosenberg, M., Kulkarni, G.V., Bosy, A., et al. Reproducibility and Sensitivity of Oral Malodor Measurements with a Portable Sulphide Monitor. (1991) J Dent Res 70(11): 1436–1440. 20. Iwamoto, T., Suzuki, N., Tanabe, K., et al. Effects of probiotic Lactobacillus salivarius WB21 on halitosis and oral health: an open-label pilot trial. (2010) Oral Surg Oral Med Oral Pathol Oral Radiol Endod 110(2): 201–208. 21. Winkel, E.G., Roldán, S., Van Winkelhoff, A.J., et al. Clinical effects of a new mouth rinse containing chlorhexidine, cetylpiridinium chloride and zinc lactate on oral halitosis. A dual-center, double-blind placebo-contolled study. (2003) J Clin Periodontol 30(4): 300–306. 22. Silness, J., Löe, H. Periodontal disease in pregnancy. II. Correlation between oral hygiene and periodontal condition. (1964) Acta Odontol Scand 22: 121–135. 23. Yaegaki, K., Sanada, K. Volatile sulfur compounds in mouth air from clinical healthy subjects and patients with periodontal disease. (1992) J Periodontal Res 27: 233–238. 24. Delanghe, G., Ghyselen, J., Bollen, C., et al. An inventory of patients’ response to treatment at a multidisciplinary breath odor clinic. (1999) Quintessence Int 30(5): 307–310. 25. Roldán, S., Herrera, D., Sanz, M. Biofilms and the tongue: therapeutical approaches for the control of halitosis. (2003) Clin Oral Investig 7(4):189–197.